September 2, 2017 - We had a number of family celebrations that we were invited to this weekend, so we stayed overnight in Studio City since the family events were on both Saturday and Sunday. However we did have some free time Saturday afternoon, so we visited the Los Encinos State Historic Park in Encino. 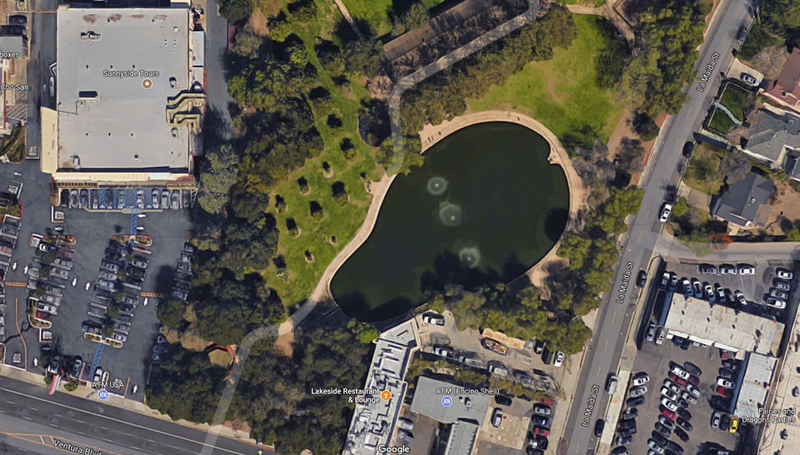 The 4.7 acre park is all that remains of the Rancho Los Encinos, which was originally a Mexican land grant. The rancho includes the original nine room de la Osa Adobe, the two-story limestone Garnier building, a blacksmith shop, a natural spring, and a pond. The natural spring provided a year-round source of water for the ancient village of Siutcanga, home to the Tongva people, for thousands of years. A description of this village was recorded as part of the 1769 Portola Expedition. The rancho passed through many hands over the years with Don Vincent de la Osa acquiring title to the land in 1851. He is credited with building the nine room adobe that remains. It was a popular rest place and roadhouse along the highway known as the El Camino Real (now Ventura Boulevard). The limestone house was built in 1872 by a French Basque shepherd, Eugene Garnier. It was a replica of his original home in France. He also walled in the spring and the pond to make it in the shape of a Spanish guitar. There is also the original blacksmith shop, which still remains here. This was a food storage shed. These two shots show the Spanish guitar shaped pool. The Lakeside Restaurant & Lounge is located within the Park, so we had lunch there. The atmosphere overlooking the pond is sublime and the food is fabulous! I started with their "Chilled Gazpacho," made with Yukon mashed potatoes, chef’s vegetables and a bordelaise sauce. Next was their "Calamari Fritti," a fried calamari appetizer with both a marinara sauce and a cilantro-lime aioli sauce. Judy had their "Chicken Lettuce Wrap," which are three baby iceberg lettuce cups filled with ground chicken, Asian Hoisin sauce, shredded carrots and lemon-grass. Everything was delicious!